When asked what the GCs saw as the in-house team’s main priorities, 63% said ‘adopt tech tools’, which covered everything from contract management systems to the growing variety of legal spend and budgeting applications now on the market (see table 1). In fact, this was more of a priority than reducing external legal spend (at 53%), which really is noteworthy. However, only 22% saw creating their own legal ops unit inside the business as a priority. 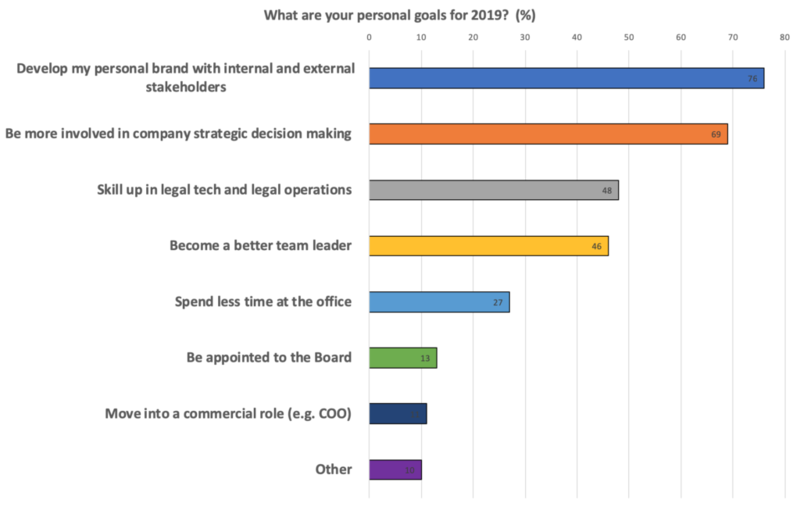 Yet, when asked what their personal goals were as GCs, 48% said they’d like to ‘skill up’ in areas such as legal tech and legal ops (see table 2). Table 1 – Lexoo survey, 2019. Table 2 – Lexoo survey, 2019. From Artificial Lawyer’s point of view, this seems to show that GCs are increasingly looking at legal tech to provide solutions to the problems they face. If this wasn’t the case after several years of wall to wall conference content on the importance of embracing legal tech, then that would have been worrying. But, it looks like GCs are focused on what tech can do to transform processes and solve challenges. 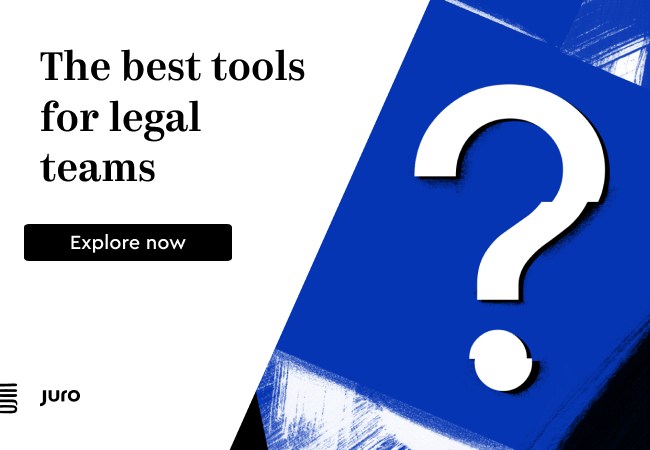 The question now is: if in-house teams embrace tech tools that make the conduct of the legal function easier and more efficient, will this impact law firms? Hard to tell yet, is the answer. If the tools they use are more operational in focus, e.g. spend management, then aside from driving more fixed fees and tighter budgets, it may not impact firms too much as they are already well-versed in meeting clients’ increasing pricing pressures. But, if it means GCs will seek to rapidly expand the more strategic aspects of legal technology, such as automating legal tasks, from doc creation, to doc review, and keep that work inhouse because now they can with these tools, then this could impact law firm more significantly. One could say a law firm can adapt to new prices for certain types of work, but simply no longer being asked to do that work leaves them with a whole new type of business challenge. Which is why the next element – the interest in legal ops is so important. GCs say they are interested in this…but, they don’t all want to create a legal ops unit internally. And, in fact, some in-house teams may simply not have the resources to do that, even if they wanted to. 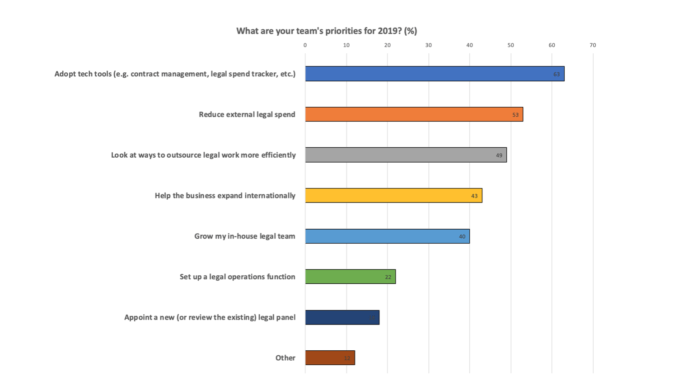 That leaves a huge opportunity on the table for law firms to provide a more consultative-style service to clients, who – at least in this survey – say that they care about legal ops and legal tech, but don’t necessarily have the resources or desire to build a business unit to handle things such as: assessing needs and isolating problems; finding potential solutions (whether build own or buy); testing solutions, and then managing and iterating that solution over time. 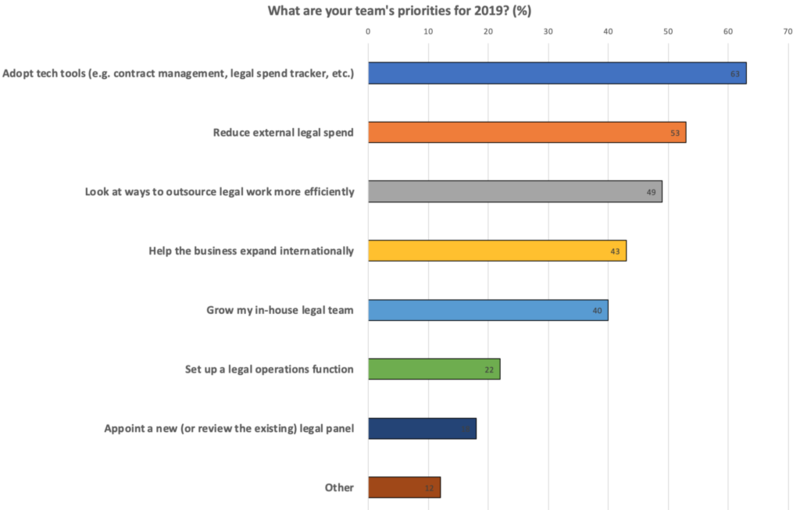 Conclusion: what this survey tells us is that legal ops is a growing business opportunity for law firms, especially where it comes to implementing new technology solutions for increasingly receptive GCs. Interesting study, but I’m surprised you didn’t pick up on the high level of interest (49%) in finding ways to outsource legal work more efficiently. I’m thinking of the new non-traditional tech-focused law firms, alternative legal service providers (including solo lawyers working part-time or moonlighting), and the technology firms that are making it easier for in-house departments to efficiently outsource legal work. 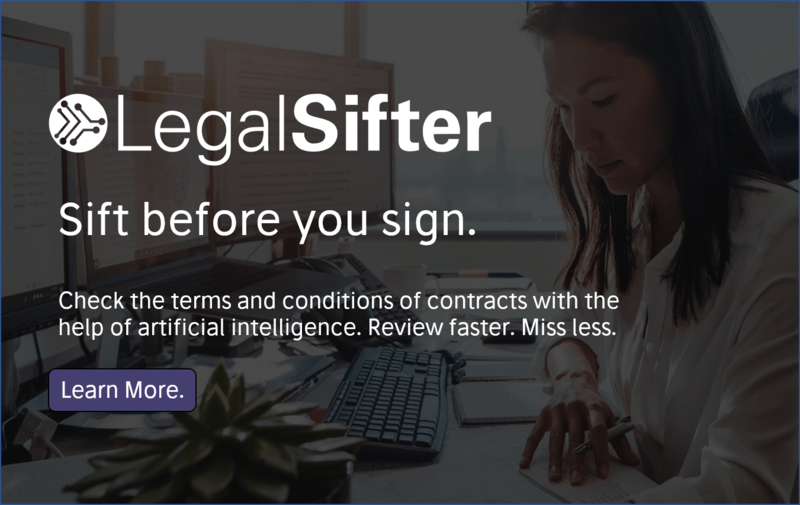 Things like AI contract analysis tools coupled with automated playbooks embedded with the company’s knowledge and standards will open up more options for legal departments to flexibly and efficiently outsource a lot of their contract work without taking on more full-time staff. And I doubt that much of that kind of work will go to traditional law firms.